As if we don’t have enough smart assistants already, after months of speculation, Samsung finally took its AI-powered voice helper Bixby and put it in a speaker that its calling the Galaxy Home. The device was revealed today at Samsung’s Unpacked event which also saw the official announcement of the Galaxy Note 9 and new Galaxy Watch. And while Samsung was light on details regarding the new Galaxy Home, Samsung did tease a few things. Sporting what looks the kind of mesh fabric used on a Google Home Mini and Home Max, with a trio of legs and a weird bulbous shape, the Galaxy Home is what I imagine a HomePod might look like if it was designed by little gray space aliens. It’s definitely a distinct look that might not fit in every home. Additionally, Samsung announced a new partnership with Spotify to become the preferred streaming music provider across all of Samsung devices, including the phones, TVs, speakers, and more. 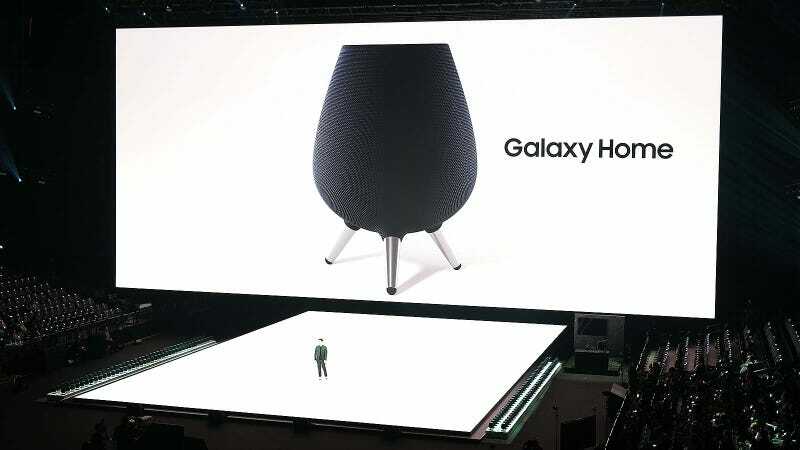 Samsung says that the Galaxy Home will feature omnidirectional speakers tuned by AKG and eight far-field mics to support the same kind of voice interaction you’d expect from a smart speaker. Samsung also put on a little demo that showed off the Galaxy Home’s ability to seamlessly transfer music being played on your phone, and then broadcast it over speakers without losing a beat. Additionally, it seems Bixby itself has gotten a upgrade thanks to new, more powerful contextual language recognition and the ability to book restaurant reservations via Yelp or purchase tickets using Ticketmaster without needing to the install those services’ respective apps. As for how the speaker sounds? It’s difficult to get a good assessment from Samsung’s demo, which featured dozens of the speakers playing in sync in the cavernous Barclays Center. It sounded fine enough, but I’d hardly call it an accurate demonstration. If you’re actually considering buying one, it seems you’re going to be waiting a little while longer, as Samsung did not announce a price or release date for the Galaxy Home. Instead, it seems more details about Samsung’s Bixby-powered speaker will be revealed at Samsung’s Developers Conference scheduled for early November.